Numerology is a revolutionary new MIDI sequencer, it is a modular sequencing environment designed for performing musicians. It works by giving the user an organized workspace within which they can quickly create and connect together a variety of highly functional sequencing and MIDI event generating modules. 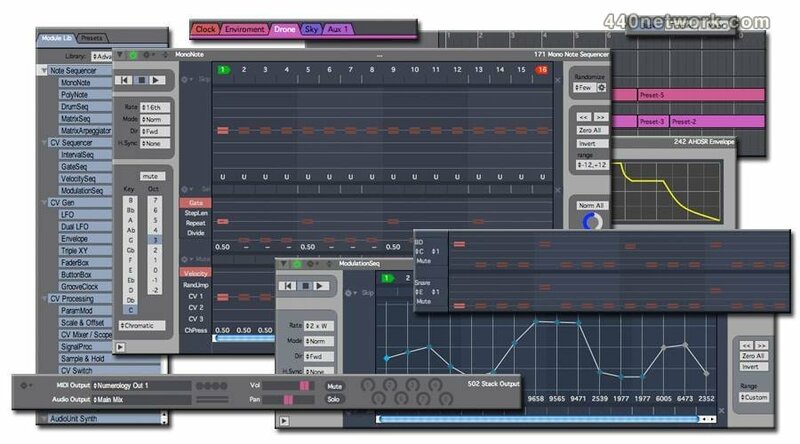 As a fully modular environment, the user can construct sequencing instruments that fit their own unique and twisted requirements. The sequencers follow a model similar to that used by analog sequencers: the user creates sequences of control values that can be routed to other modules to control generation of notes or MIDI CC and Pitch Bend messages. Audio Files : Fixed an issue reading factory audio files (*.fa) in N4 plugins. Routing : Fixed a layout issue when collapsing all modules. Prefs: Now always shows the first pref on opening. Navigator: Got rid of transparency in El Cap. Yuk. Launchpad PRO : The 'top buttons' now light up properly. Keyboard : the 'poly' setting is now on by default. LFO & ModSeq Param Mod : fixed a problem w/ min/max value setting as the target param is changed. Browser : Audio Preview : shortened attack on sample playback. Sample Kit : Fixed a routing bug when adding FX after the SampleKit in a stack. Launchpad : Drum Seq : Fixed an issue w/ increment/decrement part (i.e. up/down buttons) in Velocity Edit mode. ReWire : I disabled the (non-working) locate function until it can be supported properly. 64-bit: There are now 64-bit versions of the Numerology App, ReWire driver and Plugins. The App and Plugins are also still available to run in 32-bit mode. Numerology requires a Mac with an Intel chip running Mac OS 10.6.8 or later. RTA Recording : There is a new realtime automation feature for recording and loop-playback of gestures from MIDI and OSC controllers as a pattern is playing. RTA loops can be up to 64 beats long and recording can be set to fixed lengths or looped on-the-fly. N4 SE is limited to 4 concurrent RTA tracks. There is an RTA Report dialog for viewing what RTA tracks are active at any time. From that dialog they can be muted or deleted. ?- SampleKit : A new sample-playback module with zoomable waveforms and a flexible synthesis engine. All new demo projects, stacks, built-in sounds and audio samples.? The Browser: There is a new integrated browser for Modules, Stacks, Audio Files & MIDI Files. You can browse module presets, stacks, AU preset files and audio & MIDI files. Module presets and stacks can be loaded via drag-&-drop. Audio files can be previewed and added to a project via drag-&-drop as well. The browser displays both factory-installed modules & stacks as well as user created modules, stacks and other file types. You can directly insert a new module from a preset file by dragging it into a stack. You can load a module preset onto an existing module of the same type by dropping the module preset file on top of the target module. There is an auto-load function for quickly auditioning module presets and audio files. Drag & Drop Export for Module Presets : There is a new 'floppy' icon on each module's header. By clicking on it then dragging it to the Browser, you can export that modules's settings as a preset file. Preset Length : Numerology's Stack Presets can now have an assigned length in beats. That length can be used for quantizing preset changes in time, and the preset playlist's 'play length' settings are now calibrated in 'preset lengths', which makes it much easier to build simple arrangements. The Timeline can now record preset changes in realtime. It also has much-improved zooming with zoom in/out buttons, more natural zoom levels, and more zooming range overall. The timeline now has a draggable wiper, and you can control-click on a track to insert a preset block. MIDI Clips : All Numerology's stacks now have a built-in MIDI loop recorder that keeps track of all MIDI generated by a stack. These clips are can be exported to any app that can read MIDI files. There is a new Controller Setup dialog for managing MIDI & OSC controllers. N4 adds support for using multiple Launchpads at the same time, all varieties are supported: Launchpad, Launchpad S, Launchpad Mini. There is now support for the Ableton Push & OHM RGB, with all the same functions as the Launchpad mapping. Support for the Keyboard module from all grid controllers, (with velocity & pitch bend on the Push). 'Ableton Compatibility Mode' allows using a Launchpad with both Numerology and Ableton Live at the same time. There is now support for programming accidentals (pitch values not in the currently selected scale) in all grid controllers for the MonoNote and PolyNote sequencer modules. There is a new Transport Remote controller option with both OSC and MIDI variants. There is a new Mixer Remote controller option, also with both OSC and MIDI variants. Undo/Redo : N4 Pro supports undo & redo for many common operations, along with an undo history dialog and up to 999 levels of undo. Track Delays : N4 Pro now has track delays on all tracks (a.k.a stacks), with automatic delay compensation for hosted plugins. N4 Pro has an all-new OSC implementation with support for Bonjour, multiple OSC sources, the ability to map 'multi-float' OSC messages to sequencer sliders, and much better overall compatibility with various OSC controller apps and message types. There is a new 'direct access' OSC messaging api for setting parameters and changing presets. OSC is now supported in the Numerology AU, AU MIDI Effect and VST plugins. There is now an OSC input module for converting OSC signals to Numerology's internal CV signal format. There are new 'heads-up' overlays when dragging modules within or into a stack to make it clear where the module will be inserted, or if it will be loaded as a preset. All user-generated files other than projects are now saved in folders created within ~/Music/Five12. The ChordSeq module has a new 'best-fit' algorithm for automatically choosing the correct chord type given a key, scale & base interval. Much better performance when loading and saving projects. Stack Preset Control via MIDI : There is now an option to turn on an 'auto-assignment' property in the Stack Detail dialog. This makes it easy to setup control of stack presets via MIDI Note On or Program Change messages. LFO & DualLFO : These modules now have automatic, sample-accurate tempo tracking for all beat-based frequency modes. LFO & DualLFO : 'Period' values for musically-based units (1/16, beat, bar) are now always quantized to integer values when using the slider, but you can still enter fractional values with the number box. LFO & DualLFO : There is a new 'wide mode' range setting for the LFO and DualLFO modules makes it easy to cover a very wide range of speeds with a single slider. Installation: There's a new 'integrated' installer script, along with preferences for whether the plugins and ReWire driver are installed. There is now a 'Check for Updates' menu option. Tooltips : Most modules & UI controls now have tooltips. Transport: There is now a dedicated Record button on the transport. 'Double Seq' : All sequencers now have a single button that can be used to double the length of a sequence and 'copy out' the sequencer steps at the same time. Better handling of MIDI devices as they are added and removed. Numerology AU & VST: Spacebar events are now passed to the host. Documentation and the README.txt file can now be accessed via a 'Doc' menu. An update release with various tweaks and improvements, including a latency fix for both the N3 VST & AU, a few Lion fixes, a couple fixes for large files, and various other improvements. Now available in a handy VST format, Numerology 3.1 makes it yet easier to integrate step sequencing into the Mac-based DAW of your choice. Version 3.1 also adds realtime recording for the MonoNote, PolyNode and DrumSeq modules, both via MIDI and Numerology's groundbreaking Launchpad mapping. And, further expanding the Launchpad mayhem, 3.1 adds full mappings for all of Numerology's CV sequencer modules. Fixed an update issue with the Launchpad when using multiple Numerology AU's. Fixed a problem where the invert and 'zero' buttons were not drawing properly in the AU version. Fixed a problem when mapping an OSC control to the GateSeq step values. Fixed a crash in the N3 ReWire driver related to deleting a track in Reaper when running Numerology in ReWire mode. Fixed a crash related to ReWire mode. Fixed a problem with the ChordSeq Launchpad mapping that could cause the UI to freeze up. Fixed a problem where the MatrixArp's "Chord, Sort & Trim" and "Chord, Trim" modes would not work properly when the transport was not running. Fixed a problem in the "Generate" feature that could cause a crash. Updated the text in the demo dialog to properly match the demo mode. Numerology AU : you can now change stack presets with MIDI note and prog change commands from the AU Host. Stack Export : Fixed a problem related to renaming the stack on export. All Sequencers : You can now use option-click (and drag) to set any sequencer slider to its default value. For the Note Sequencers, you can also use shift-option-click (and drag) to play the note for a given sequencer step. Now includes the Launchpad Cheat Sheet & Labels. Changed the page numbering so that the page numbers match the absolute page count from the very beginning of the manual. ReWire : Fixed a conflict between the Numerology 2 & Numerology 3 ReWire drivers. Numerology AU : You can now use MIDI Note & Program Change events to change presets. - Fixed a problem related to custom ranges when importing a module preset. - the IntervalSeq and VelocitySeq modules now have separate module preset directories. The AU now remembers the size of the editor window. Fixed a couple problems with the Alt MIDI output. OSC: There is now a preference to turn OSC on and off. It is off by default, so if you use OSC, be sure to turn it on! SampleSynth: Fixed a tuning problem when using very short waveforms. Launchpad : Fixed a problem when using pentatonic scales. - fixed an issue with CC learn. - fixed some issues with the Launchpad mapping. N-AU & ReWire Modes : Host transport loops are handled much more cleanly. Fixed a bug related to handling serial numbers. Fixed a problem with waveform display in ReWire mode. Fixed a couple issues with the "TRK" arrange mode. Several algorithms have been tweaked to not change sequence length, which makes them more flexible. There are now some templates with Note Sequencers. There are two different template sets, one for the app, and one for the AU version. Fixed a audio glitch when opening the editor window on a stack with a SampleSynth. Fixed a crash that would occur when exporting a stack with no category set. The preset playlist total is now updated properly with each change to the playlist. Fixed a layout bug related to resizing the project window. The LFO and DualLFO modules now track the incoming clock signal exactly when running in beat, bar or sixteenth modes. Changed the AU hosting window for AU's with 'Carbon' UI's to be 'compositing'. The 'pitch output quantizer' within the ChordSeq has been turned off, as it made it impossible to get certain chord combinations, such as a major III chord within a minor scale. However, the 'scale' menu is still used to determine what each degree means (III means E in C major, but E flat in C minor, etc). SilentWay Voice Controller : Numerology 2 now supports a built-in AC encoding option for this plugin. When you look in the module library, you will see two instances of this plugin, one for DC operation, and one for AC operation. If you chose the AC option, you will also get to select the min/max value for the output, as well as the polarity of each output pair. Fixed a bug related to routing CV signals to either Silent Way Voice Controller or Volta. PolyNote: fixed a bug where the per-step mute buttons were not working properly in legato mode. Rack : fixed a bug where after moving a stack, sequencers would not animate properly when running. Mixer: Fixed a bug where the on/off btn for a stack would not update properly on the mixer channel after loading a project. MIDI Filter : This module now has channel-based filter on input. If "MIDI Ch In" is set to "Omni", it will pass all messages. If it is set to a specific channel, then only MIDI input on that channel will be passed. Fixed a drawing issue with DrumSeq's longer than 16 steps. Fixed a drawing error with the ModulationSeq when the transport is moving. Drag-n-Drop of mp3 and m4a files into the AudioSample and DrumKit modules is now supported. You can now import mp3 and m4a files in the DrumKit (was already supported in the AudioSample module). Fixed a some stuff in the rendering code that could cause audio dropouts. Fixed some freezes related to using the Launchpad with the Chord Sequencer. Fixed a crash on startup related to some AUs. Fixed some issues related to loading files created with Numerology 3 Pro. New Scales: Harmonic Minor, Melodic Minor, Whole Tone and two Octatonic scales (both alternating whole/half step combinations). These will show up in all quantization menus. DrumSeq : There is now an alternate edit mode page that allows you to edit velocities for each of the 8 tracks in a DrumSeq module. It works much like the MonoNote & PolyNote mappings do, but instead of using the top row to pick an octave, use use the top row to pick a drum track. To get to this mode, press the "edit" button (i.e. the topmost "scene" button) until it goes red. ChordSeq : If the Arp Mode is set to Strum, Arpeggiate or Broken Chord, then the launchpad mapping for the "divide" page will change to match. Fixed a problem where picking the 2nd module in a stack (on the Rack Nav page) could change the speed of that sequence. Audio Prefs : Fixed some string conversions to properly handle non-ASCII characters (i.e. accents and such). Fixed a preset change glitch that could happen if you triggered a preset change immediately after a new bar. The reported parameter range of "Curr Step" has been increased to 1-128. If you assign (via Param Mod) a value outside the current max length of the sequence, it will be ignored. The randomization behavior of the sequencers has been tweaked a bit to be more predictable. This is in preparation for a randomization prefs feature coming in 3.0. GateSeq: fixed a drawing issue w/ the vertical background stripes. DrumKit: The default values for the sustain and release segments of the envelopes are now at their max values, so that newly added samples will always play their full length (or at least about 10 seconds of it). New in this version is control support for the Novation Launchpad. This allows you to program and control all the "Note Sequencer" modules in Numerology from the Launchpad, which includes the MonoNote, PolyNote, Chord Seq, Drum Seq, Matrix Seq and Matrix Arpeggiator. In addition, there is a dedicated mode for triggering presets and for accessing the most important settings of the Mixer. Preliminary doc & "Sticker" templates are in the "Goodies" folder with this install. The labels are designed for Avery brand "8253" 2" x 4" labels (10 labels per sheet). These labels print nicely, but they tend to not want to peel off cleanly, so don't get upset if you end up with "sticky goo" on your controller. Fixed a bug whereby the "CV" port on the Stack Input module would only connect to a single destination at a time. MonoNote : Fixed an error in MIDI Note Off generation related to running in legato mode. CCGen/NRPN Gen: In the CCGen module, fixed some inconsistent behavior: On transport start, both 'voices' now properly send an initial-value CC message. An when no CV connection is made on the input, no CC values are generated at all. The same fixes have been applied to the NrpnGen module. CCGen/NRPN Gen: I've turned off auto-routing for the CcGen and NrpnGen module CV inputs when they are added to a new stack, the behavior is not consistent enough to do the right thing more than 1/2 the time. NoteProcessor: Fixed a conflict between velocity offset and velocity randomize that could cause missing notes. LFO/DualLFO : Fixed a random number uniqueness issue with the S&H waveform. IntervalSeq : Fixed a problem with stripe bg colors when adding this module to the top of a stack. DrumSeq : Fixed a problem with the "clear" buttons for step skips and step mutes. MIDI Learn : Changes to a project made via hardware MIDI controllers now properly set the project as "edited". Number Boxes: Tweaked the handling of "-" keys to make it easier to enter negative numbers. Numerology 2.1's new ReWire driver now offers full support for running Audio Unit plugins, including their editor windows. This innovative feature allows the user to seamlessly integrate Numerology with ReWire host applications while maintaing nearly all features that are present when running standalone, the only missing item being audio input. Other improvements to the ReWire implementation include the addition of 30 audio output channels, bringing the total to 16 stereo pairs. This driver also includes fixes to some transport related problems, and much reduced CPU overhead. The new Chord Sequencer module makes it easy to build chord progressions using a series of sequenced high-level parameters, including scale degree (I, IV, V, etc), chord family and type (including 10 types of 7th chords), inversion, spacing and octave offset. The Chord Sequencer also includes options to strum and arpeggiate the notes of a chord, or to play them as "broken" chords. Whether the user is complete newbie or a seasoned pro the Chord Sequencer makes building and experimenting with chord progressions a quick and enjoyable task. Numerology's MonoNote, PolyNote and Drum Sequencer modules now offer both real-time and step-time sequence recording options. This feature allows you to program steps from a MIDI keyboard and, in conjunction with several other features of Numerology's sequencing modules, opens up several interesting compositional options including "sound on sound" looped composition, and generative auto-accompaniment. All of Numerology's Note Sequencer modules now have per-step groove controls that allow the timing of each step to be individually pushed or pulled relative to the overall tempo. Combined with the groove timing options of Numerology's GrooveClock module, this offers the most flexible set of timing options of any sequencing application. A Keyboard module which emulates a MIDI keyboard. It can be use for triggering sounds, and for monitoring MIDI note streams. A new set of I/O modules for additional flexibility in routing MIDI, Audio and CV signals. A new 'step-trigger' option for all sequencers to make it easier to emulate the behavior of analog step sequencers. And, of course, many general fixes and updates. The complete list of changes can be found in the readme file included with all Numerology installations. 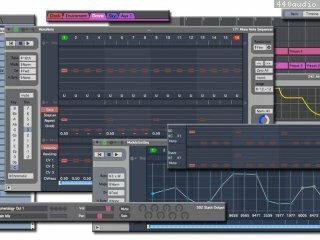 This release includes many fixes and improvements, as well as couple of handy new features, including .mp3 and .m4a file support for the AudioSample and DrumKit modules, and "on the fly" audio recording support. Added Examples folder to the download. Cleaned up some debug messags. much reduced latency when slave sync'd to other programs. much reduced latency when acting as sync master on 10.5.6. On Macs with OS 10.5.6, thanks to an Apple bug fix, Numerology will properly follow locates and transport loops when sync'd via MIDI Clock. There is a bit of a stutter with Logic, but I will be working on ways to avoid that. Fixed a crash related to the Commentary Module. Fixed a crash that could happen on Mac's with no audio input. Improved timing for MIDI events over longer periods of time (> 10 minutes). There will still be some delay, and a very small amount of jitter, but those can easily be accomodated for in a host app by quantizing a bit. Fixed a problem with the Comment module that could cause an error when saving a file. Fixed a crash that could occur on startup on Mac's with no audio input. Changed the name of the app from "Numerology2Beta" to "Numerology2"
Fixed a crash that could happen by attempting to assign a MIDI CC, or setup param mod on a waveform view. Drag & Drop : you can now drag-n-drop audio files from the Finder (aiff, wav, sd2) directly into the 'waveform' views to load them. In the DrumKit, you can load multiple files at once, if you like. Fixed a bug where samples would not be properly loaded if the Sample was loaded from the project's media folder, and the stack was duplicated. Auto-mapped AU's now load properly. You can now quit while the transport is running. Fixed a bug where Stacks that are turned off could continue to produce a buzzing sound through their aux sends. Fixed a stuck-note bug w/ the NoteGen module. Fixed a stuck-note problem with the NoteQuantizer. Fixed a bug where the "rec" light would blink in the transport after recording was disabled. Fixed a problem with the pitch grid scroller -- it would get off-track when changing the height of the pitch grid. Improved the timing accuracy of the CcGen and NrpnGen modules. Fixed a nasty stack-overflow crash that could happen if you made a CV feedback loop within a stack. Many other fixes and updates. Now has a manual play/stop button. Also now has an 'auto' button. When active, the loop will auto start and stop with the master transport. that are longer (more than about 1/30 of a second), but for short, 'oscillator'-type loops, it is quite amazing -- it gives you hard-sync types of timbral modulation while keeping the base pitch steady. I've begun to review the doc and address ITS problems :), staring with the reference pages -- you'll be able to identify them as they have the "DRAFT"
tag removed from their titles. There are also new ref doc pages for the AudioSample and DrumKit modules. The LFO & DualLFO are now more responsive to frequency/period related changes while running. The DrumSeq prototype module now starts with 8 tracks, to match up with the DrumKit module. The default velocity sensitivity of the AudioSample is now 0.5. It's basically 8 "Audio Sample" players in one module, with definable note ranges, adjustable velocity sensitivity, a pair of choke options (parts 4-3 and 8-7), per-part panning, and individual outputs. The default note ranges for the DrumSeq have been adjusted to match. Each module has a full AHDSR amplitude envelope, and a loop x-fade control, so you're not limited to just percussive sounds. You can set the note range to be anything you like, so you can do tuned percusson FX sounds, or note-based multisamples quite easily. Tuning of samples is adjusted so that the low-note is always at the 'nominal' tuning for the sample. Each part has a 'mute' button (adjacent to the volume control). It mutes the part from the Main Out, but not the individual outputs, making it easy to setup per-part processing easily. Remember that all you have to do to mix such parts back in, is to connect the audio output for it (or it's custom processing chain), into the audio output of the stack (or anywhere else). - You can modulate the crap out of any param easily. - You can use as many DrumKit modules as you like. Each part currently only has 2 voices. Sample loading happens on the audio render thread -- this is a HUGE NO NO, but really not any worse than what other drum samplers do when they load samples. The workaround is easy: don't load samples while the transport is running if you don't want any undue glitching. The sample start point must always be less than or equal to the loop start point. The loop start point must always be less than or equal to the loop end point. These rules are there so that cross-fade algorithm has a known set of conditions to deal with. As I get more time to work on the sample-playback algorithm, I may relex them. Now, when you save a project that includes an AudioSample or DrumKit module, you will be asked if you would like to copy the samples into the media folder for that project. If you chose to do so, they will be copied into a folder called "AudioSamples" within the media folder. In the module menu for each module (on the left-side of the module header), there is now an option to export the module. This will create a file with the extension ".nmod", and an accompanying media folder (if appropriate). If the module is an AudioSample or DrumKit, all samples will be copied in automatically. You will also have the option of making a .zip archive of the result. That .zip file is what you should use to share modules. Exported modules include only the settings for the preset that is current when they are exported -- this is to avoid odd behavior when importing a module into a stack that already has several presets. If you want to share a module that has multiple presets, see the instructions in the "File Exchange : Stacks" forum at five12.net. This item is in the Stack menu, and allows you to import .nmod files into the current stack. Once again, the spectre of VST-originated behavior within some AudioUnits has made its unwelcome appearance. In this case it means that Numerology can only safely load AU Presets for an AudioUnit on the main UI thread. I have implemented this behavior with the new build, which should improve AU reliability significantly, but it has two important ramifications: Numerology can no longer change AU presets when Numerology Stack presets change (as there are unresolvable timing issues), and Numerology can no longer load AU presets when in ReWire mode. Numerology loads a project with an AU that plays back samples. While opening the project (which happens on a background thread), Numerology loads the preset data for that AU and sets it. The AU reads the preset data, and tries loading sample files referenced by it, but can't find them. So it decides to open a dialog to warn the user. This may seem like a reasonable thing to do, except that when you try to pop up a dialog from a non-UI thread, you invariably lock up the app altogether. This is why the dudes on the CoreAudio team say not to run UI code on certain AU api calls, but many AU developers do it anyway. What should probably happen is that the AU should return an error code when the host tries to set the AU preset data, then also report the error to the user, when the user opens the UI for that AudioUnit. In addition to setting the AU preset when a session loads, Numerology (before now) could also change the AU preset when changing stack presets, and did so in a sample-accurate manner. For some 'large' AudioUnits, this was of limited usefulness (as it could cause glitches), but for the 'smaller' ones (i.e. anything from Apple, and many others), it allowed us the luxury of being able to tweak AU parameters for each of the presets in a stack (just like you can for Numerology's 'native' modules). I may restore this behavior later on, for AU's that can handle it, but it is off for now. When you load a preset for an AU module, that preset stays constant (static) for all your stack presets. When you load a project, Numerology will restore the state of all AUs from AU Preset data stored with the project. (also as before). If the AU is small, or the number of params you need to tweak are manageable, then you can use the FaderBox and ParamMod modules to build a custom control surface. I've done this with GuitarRig and AugustusLoop and it works very well. With some AU's, you may be able to use MIDI program change messages. As the on/off switch for each module is always 'stack preset aware', you can actually add multiple copies of an AU and switch them on and off with stack presets. Modules that are 'off' are not rendered, so there is no CPU load issue. AU hosting has been disabled in ReWire mode for now -- due to reasons discussed above, Numerology can only reliably change presets for AU's in the UI, which is not possible in ReWire mode. Well, without preset support, the only way to control AU's in ReWire mode is to use ParamMod, which is only practical for a very few AU's. Of course, you should just host them in the ReWire host app. Recording now works in ReWire mode -- not that there's any real reason to use it, but it does work. You can now set custom names for each pair of audio inputs and outputs, as well as enable & disable I/O in stereo pairs. Settings are saved per-device, so you can have custom settings for each device. The deviced used is the currently active one, so if you go into Preferences and change the audio device, you'll have to restart Numerology before you can edit the PatchbaySetup for that device. The default audio I/O setup (which what you'll all get when you startup), only the first pair of inputs and outpus are enabled, so if you use lots of I/O, you will need to manually enable them. The first pair of audio outputs are always enabled. I've rewritten some of Numerology's internal memory management code, and fixed several crashes and other conditions that could cause crashes, including one that could happen when starting up, and another that tended to happen when opening files. The new code will check for an existing old p-bay setup file in the old location (/Library/Application Support/Five12/Numerology) and copy it's settings to the new location. fixed a 'buzz' sound that could happen when deleting AU Synths. fixed a stuck note problem that could happen with external sync. The level knob in the LFO module works again. Fixed a suble display bug affecting the Routing page for modules. Stopped the "Rec" indicator in the transport from 'floating around' when resizing the project window. Fixed a display bug in ParamMod related to the display of some parameters, including "StartStep" and "EndStep"
Sequencers: Fixed several bugs that would occur when the start step is greater than the end step. This beta introduces two major new features for Numerology: Audio Recording and a simple, but highly useful polyphonic Audio Sample player. Also included are various improvements to AU hosting and Parameter Modulation. Fixed a bug where pan was not saved/restored with a file. - each time the "ProgramNum" parameter is changed, it will send out a program change msg. the MidiSwitch & SignalSwitch modules should now work correctly. the UI does not display a value different from what the sequencer outputs. fixed a bug that could cause a crash when deleting a group. with earlier versions, let me know, but the two versions listed above will be the only officially supported versions. Most of the UI controls in this version have been revised to avoid variousn drawing errors that occurred with earlier versions. Please report any further drawing errors you may see. When setting factory presets for AUs, Numerology now sends both preset number and name. Some recent AU's crash if you don't also send the name (which according to the AU spec, should be optional for factory presets). "mouseMoved" events are now turned on for AU edit windows, this allows mouse-overs and menus to work more smoothly. In particular this was an issue w/ NI plugins. other plugins based on the UVI engine. Please report any problems. This is a great software made greater! Quite possibly the quickest $100 bucks I did not intend to spend tomorrow. Just when you thought the general midi sounds had no more life in them, not! It is amazing how something so seemingly random, can produce music so seemingly deliberate. Make quality sounds right now, no waiting! Numerology is a whole lot more than the sum of it's parts. The live synths built into Reaktor sound very cool, but you find you pretty much get the same cool sound, 200 different ways. Numerology produces completely unique and diverse sounds, and never seems like it can hit a creative brick wall. Something new is always at your finger tips. I already feel a bit possessive of the program. MINEMINEMINEMINE! Remember when you were the only guy into that way cool band before they got hugely famous? Well, Numerology - say you were there before that happened. If you want to pattern-sequence a hardware synth in OSX, i say get this NOW! I used combined with Novation A-station and digi002 rack, worked seamlessly and awesome sound. Very cool indeed. Plus qu'un séquenceur MIDI, Numerology2 est un outil de composition qui reprend la philosophie des "step-sequencers" équipant les premiers système de synthétiseurs modulaires ... Les capacités sont sans commune mesure avec ce qui se faisait à cette époque, ouvrant la porte à des montages d'une complexité et d'une puissance incroyable .... tout en restant simple et accessible. Numerology2 est unique et propose un changement radical par rapport aux séquenceurs classiques qui se ressemblent tous plus ou moins ... A découvrir sans tarder. Un Must Have ! A chaque fois meilleur. Comme le bon vin. Excellent soft !